Neither our theatre scene nor playwright Alfian Sa’at is a stranger to political plays. But what the avid theatre-goer would have been used to is a play that focuses on a particular issue, and offers a barrage of criticisms; some vociferous, while others are comical. In Geng Rebut Cabinet (GRC), we see Alfian Sa’at unfurling his list of criticisms of government policies, especially those which affect different racial groups, and frame all of them within the boundaries of a political farce. From the lack of Malays in the main military roles; to the lack of Malay representation in local popular culture; to the media releasing negative statistics according racial lines, nothing escapes this playwright. Despite packing in so many issues and criticisms, he achieves the incredible feat of not allowing it to be overbearing, didactic, or a tiresome lament. His creation of a hypothetical Singapore with Malays being the majority, while the Chinese the minority of the population is a defamiliarising element that throws the justifications the government gives for their policies into sharper relief. It is within this sophisticated structure that the plot of five candidates from the ruling party contesting to win a group representational constituency in an election progresses. 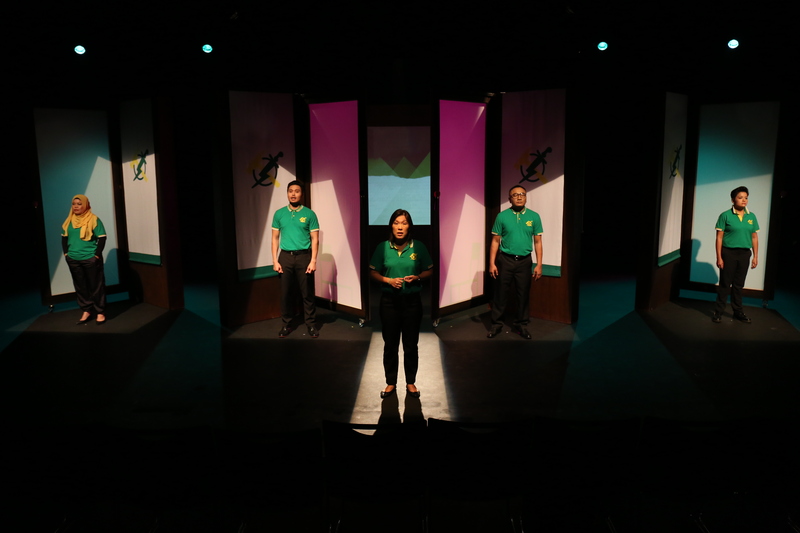 As Catherine Seah (played by Serene Chen), the minority Chinese candidate, deviates from the party line by campaigning for improving the Chinese community, the play poses questions that transcends beyond race issues: Who should a politician represent? What constitutes the people? Should one campaign for what one believes in despite in displeasing one’s constituents? These questions are raised as Catherine comes into conflict with her colleagues: grassroots activist Zainab Halim (Dhalifah Shahril), Minister of Human Resources Roslan Jantan (Khairudin Samsudin), retired Brigadier-General Bukhari Ghazali (Fir Rahman), and Maisarah Hamdan (Farah Ong); a lawyer who neither harps on her homosexuality nor identifies herself to be part of the LGBT community. While characters in a farce are not meant to be complex, the cast should be lauded for their robust performances. The comical moments are buoyant and entertaining as the actors pick up on each other cues quickly, while the tense moments are played with emotional truth as each character knows what they want out of the exchange. All said and done, the successful staging of the show, with merely an advisory that says the show is suited for 16 years and above, raises another political issue. Why did the powers that be let such a show pass? Of course, I can only offer speculations. While I would love to think that the authorities have become enlightened to allow the airing of such issues, they could be acting based on yet another old argument. Plays have very limited reach, and theatre-goers are usually more “sophisticated” than the lay person. Furthermore, the “problematic” character is Chinese and not Malay. As such, the Malay audience members would not identify with her too strongly. If that were the case, then the very existence of GRC as a staged play is a manifestation of the problems that the playwright is trying to raise.